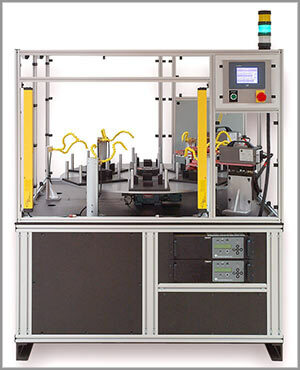 GH IA semi-automatic epoxy bonding machines are ideal for bonding flexible, epoxy-based gaskets to metal or other conductive material without a third bonding agent. Choose a pre-designed, off-the shelf system or let our engineering staff customize a design to meet your specific tooling requirements. Our cost-effective Model EB-4 Epoxy Bonding Machine includes dual 2kW induction heating power supplies and an 8-position indexing table. Front panel start/stop push buttons place the system in a PLC-controlled auto run mode with full manual control available for process development. To maximize safety, integral air quenches cool the parts before they are returned to the operator. The low voltage induction coils are isolated from earth ground.